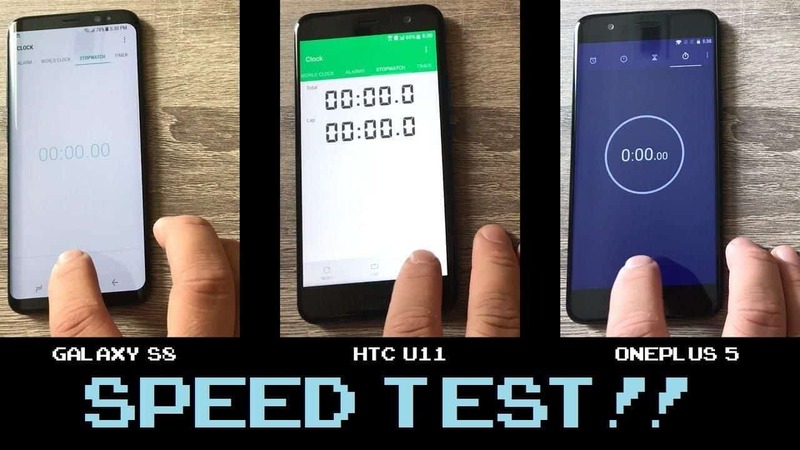 OnePlus 5 beats HTC U11 and Galaxy S8 in Snapdragon 835 Speed Test. Tech geeks, apart from looking at a mobile’s beautiful exterior would also want to take a look at what drives the mobile from the inside. From Qualcomm’s Snapdragon to Samsung’s Exynos to HiSilicon’s (Huawei owned semiconductor company) Kirin, there are a lot SoCs available in the market today. While Huawei prefers to deploy its inside-the-house SoC on most of its devices, Samsung also, has started to follow the same trend; powering its mobile devices using their Exynos processor. However, the one SoC that amidst such fierce competition manages to leave a mark in all benchmark tests is the Snapdragon series by Qualcomm. The Snapdragon 835, as described by Qualcomm, is “Small in size, big on features.”; and as a result we can see a number of mobile manufacturers powering their devices on a SD835 SoC. From the recently launched OnePlus 5, to the intuitive HTC U11, and the stunning Samsung S8, all these handsets, apart from being the flagship device for their parent companies, have one more thing in common- Snapdragon 835. And today, we’re going to tell you about which devices makes the best use of its SoC, with the help of a You-Tuber Jerome Ortega . The motive of the test was simple, to see which phone was the fastest in terms of the number of running applications. While all the three devices have an octa-core processor, the S8 has 4*2.35Ghz/4*1.9GHz core-configuration, and both the OnePlus 5 and HTC U11 have a 4*2.45GHz/4*1.9GHz core-configuration. Also the S8 and U11 have 4GB of RAM, while the OnePlus 5 has 8GB of RAM. The test was simple enough- the YouTuber would open the apps, that he regularly used, in succession, and see how quickly each device opened them. The applications then, would again be opened in a second round to see the refresh rate of the already opened apps that were running in the background. After performing a complete factory reset, he just installed the apps that had to be run for the sole purpose of this test. Just before we start (and on a totally different note), Samsung S8 was the first one to boot up, followed by OnePlus 5 and HTC U11. As soon he had the home screen, he made sure that there were no apps running in the background, and then started the timer on each device. (Round 1- Let’s open everything we have!) As soon as he hit the timer, apps that had been specially installed for this test were opened one by one, simultaneously on all the three devices. As soon as an app launched and hit it’s home screen, it was closed and the next one in the line was launched; and following this suite, apps like Instagram, HBO Now, Twitter, Hangouts and 16 others were opened in quick successions. The OnePlus 5 was the first one to hit the halfway mark; that is, while the handset was launching it’s tenth app in the from of Gmail, the U11 was one behind working its way with Google Play Movies and TV, while the S8 was two apps behind opening Spotify. The OnePlus 5 was the first one to finish round 1, completing it at 51.29″, the HTC U11 was second clocking in at 54.9″, while the Samsung S8 came third with a lap time of 1’2.98″, which is about 10s more than the OnePlus 5. (Round 2- Let’s take a look at everything again) All the apps that had been opened in the first round, were opened again. The motive was to see how soon the phone responded to an app that had already been opened before and was running in the background. We could clearly see that the OnePlus had taken significant lead halfway through the second round. Major app refreshes were observed for HBO NOW and Amazon, but still a majority of apps were opening at a much faster rate in ONePlus 5, as compared to U11 and S8. However among all the apps that had been opened again in the second round, SpeedTest (by Ookla) took the longest time to respond (i.e. find a server) in OnePlus 5, however its counterparts were able to fly by that thing much easily. Another thing worth noticing was that all the apps in S8, comparatively took much more time to respond after refreshing (guess it could be attributed to its lower clock speed of 2.35GHz). After completing the round, we had a clear winner in the form of OnePlus 5 with a clock time of 1’1.52″, with HTC U11 coming in second at 1’6.9″ and S8 last with a clock time of 1’16.01″, for the second round only. The results of this speed test were clear enough, the OnePlus 5 completed the whole routine about 9s quicker than the U11, and about 25s faster than the S8. The conclusion, you ask? The OnePlus 5 is freaking fast; faster than U11 and S8 when it comes to opening apps, and also refreshing less apps than S8 and U11. The incredible speed could also be attributed to the fact that it has 8GB of RAM as compared to 4GB in S8 and U11. Obviously no one would be opening that many apps, but then no one told you not to do it too. A new Technology will require you to charge your smartphone just 4 times in a year. List of Samsung Galaxy devices that will Get (And Not Get) Android O (v8.0) update!